No bridge or hub required. Smart light bulbs are a dime a dozen, but home device maker Elgato decided that another effective way to control your home lighting isn’t a bulb and hub or bridge set-up—it’s a smart light switch. The company’s new $50 Eve Light Switch is the first HomeKit-compatible product of its kind, which means you can control your lights with just your voice. Thanks, Siri! The simple white Bluetooth wall plate replaces your standard single pole switch, which you can either swap out yourself or call in a professional. (You can watch this video for full installation details, but note that you'll need a neutral wire in the switch box to set up the Eve switch, which some older homes lack.) The best part is you can control your lights without outfitting your house with smart bulbs and a hub—though you can use the Eve switch to control those, too, if you already have Hue lighting installed. 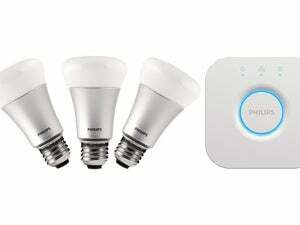 So if you already have smart light bulbs set up, why would you want a smart light switch? Because it’s easier to manage scenes with a single switch. You can connect your HomeKit-enabled Philips Hue bulbs to the Eve switch and use the Elgato Eve app to turn all the lights in your room on or off. If you install switches in every room, you can verbally turn on every light in your house if you really wanted to. The Eve switch has a touch sensor if you want to turn a room’s lights on or off by hand. If you manually turn the lights off, the switch and your smart bulbs will still be synced. Elgato is one of the few smart home device makers that is all in with Apple’s home automation standard—Eve is its eighth HomeKit-compatible device. The switch is an easy and cheap way to get started with home automation, because you don’t need to buy a bridge or a hub. You’ll need a fourth-generation Apple TV that you’ve set up as a HomeKit hub to control the switch remotely, and the Eve switch can’t be used in a three-way installation set-up where more than one switch controls the lights in a room. You can buy the Eve switch today from Elgato or on Amazon if you want to give home automation a try with a stand-alone accessory.